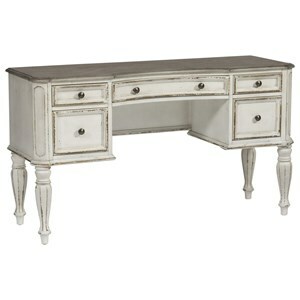 Create your ideal home office with the Jr. Executive Credenza Desk. The desk sides feature large doors for CPU storage, files, and printers. One keyboard tray with a flip-down front makes for easy computer usage. The traditional style features a two-tone design with cherry table top and chocolate finished base. Turned tapered feet and nickel plated hardware highlight the unforgettable design. 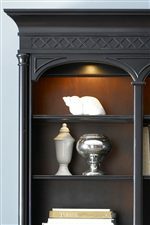 Add the matching hutch for more storage and display options. 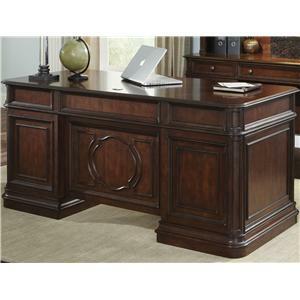 The St. Ives Jr Executive Credenza Desk by Liberty Furniture at Van Hill Furniture in the Grand Rapids, Holland, Zeeland area. Product availability may vary. Contact us for the most current availability on this product. 260-HO120T Jr Executive Credenza Top 1 66" 24" 6"
260-HO120B Jr. Executive Credenza Base 1 20" 23" 24"
The St. Ives collection is a great option if you are looking for Traditional furniture in the Grand Rapids, Holland, Zeeland area. Browse other items in the St. Ives collection from Van Hill Furniture in the Grand Rapids, Holland, Zeeland area.